Good evening friends, I hope this finds you all relaxing after a day hard at work or play! Oh, I just considered it might find you with 2 screaming children, a barking dog, a ringing phone, and smoking oven, all at the same time. Oh dear, if that is the case.... WHY are sitting reading this?! Braciole. My mother in law makes ZEE best. Now I would like to say that this is traditionally made with beef. Flank steak is my meat of choice on the regular but, I am not sure if that is REALLY traditional or just, what most people do. Isn't that the same thing? HA! Hey I had pork loin I wanted to use, so I went with it. And might I say, I am so very glad I did! This is a bit of a process, but not to bad. 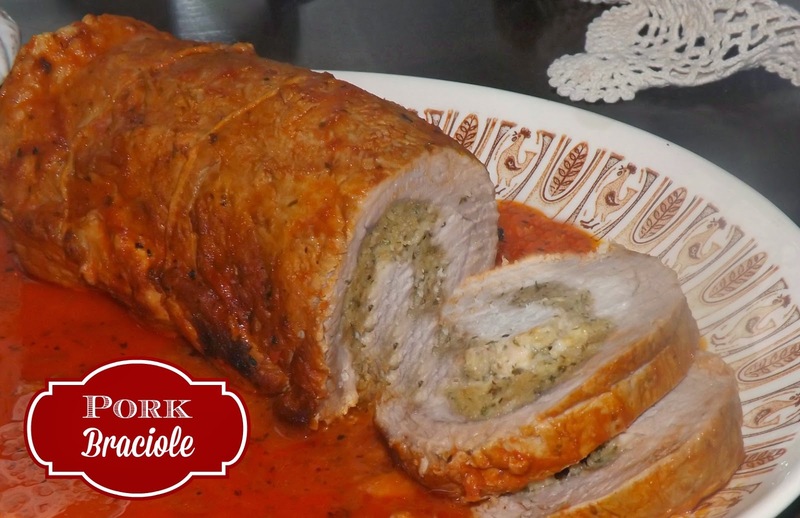 You can use small pieces of meat and make small braciole, or use a larger piece and slice it to serve several. What a great idea to get a lot of bang for your buck, one nice thick piece of steak to serve at least 4 adults. We could be on to something here! So do not let the size or instruction of the recipe keep you from trying it. It isn't hard, it is just a few steps to perfection. I used 2 small pork loins. Wait, not small, just short. I by the gargantuan size pork loins and cut them into 3. This recipe will do a large steak, or 2 pork loins as I did. First you must prepare the meat. If you can't find a thinly pounded piece of beef or pork, you will need to do it yourself. I butterflied my 2 smallish pork loins and then went to town pounding them out with a meat tenderizer. You could also use a heavy skillet if you want. Get it about 1/2 an inch thick or less all over. You know, you can really pound it to whatever thickness you like. If you do not know how to butterfly a piece of meet, just cut it horizontally, leaving about 1 inch at the end NOT cut, flip it open like a book and then start to pound it thin. Easy enough? This filling recipe will make 2 bracioles. If you are using only ONE piece of meat, HALF the recipe! Combine all ingredients together. Use more or less olive oil depending on how dry or wet your filling is. You want it to hold together when you squeeze it. I trust you can eyeball this little detail. In a large pot, brown the meat for 2-3 minutes on each side until nicely browned. When browned, add your crushed tomatoes or pasta sauce! I also add a bit of water to mine. Cover and let simmer for 1-2 hours depending on the thickness of your meat and size of the braciole! When it is done, remove and let sit for 10 minutes before slicing! Use your sauce over some short cut pasta and call it a meal! Awesome! Can't wait to make this! I love pork in sauce, don't know why I never thought to do this!